My approach to each project is to tell the story of my client through artfully capturing the details and moments that make up a shoot or event. 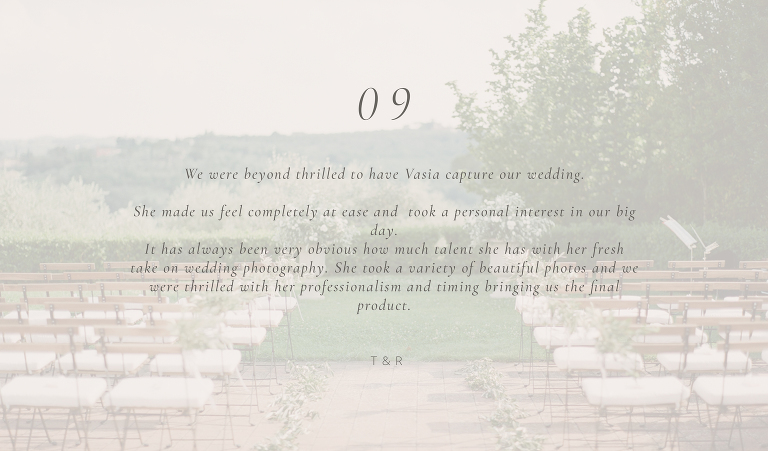 The creative process involves getting to know each client's vision and story by working with couples, planners and/or designers in the lead up to the event. In order to achieve the best possible results I can suggest a timeline for photos that will make best use of the available lighting and locations based on my scouting and research. I am based between Athens, Greece and Vancouver, Canada and am avaialble for weddings and portraits worldwide. Currently accepting weddings, portrait sessions and editorial projects. If you are looking to collaborate on a creative project please email me! For workshops and one-on-one sessions please click here. I have two home bases: Vancouver in British Columbia, Canada and Athens, Greece. I travel frequently between the two and anywhere else my camera might take me! The short answer is both. Although medium format film is my preferred tool to capture the beauty of natural light, in some cases the venue or lighting conditions might make it impossible to acheive the desired results from film. In those specific cases I will shoot digital. I also often have my second photographer shooting a mix of film and digital throughout the day. The average wedding will be about 75% film and 25% digital and I edit all digital images to closely resemble film as possible. I love to travel and will go pretty much anywhere you might hope to have your event or portrait session. 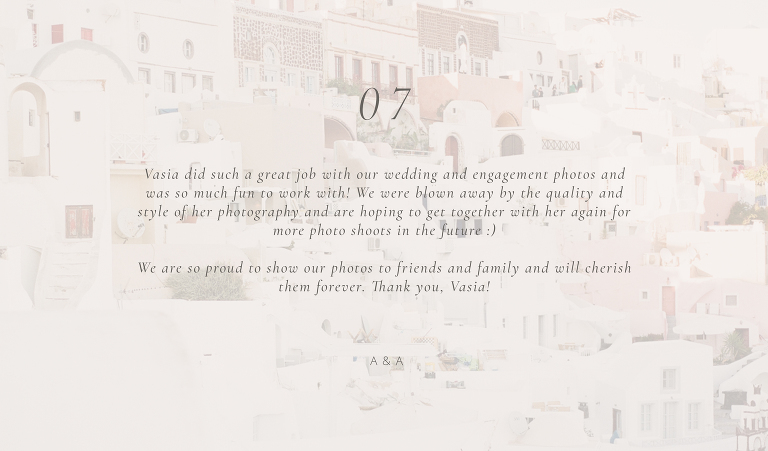 If you are planning a destination wedding I would love to hear from you! As I am based seasonally between Greece and Canada, I am often asked to photograph weddings within Europe, North America or Asia; although I often dream of exotic places that I have never had the opportunity to visit and look forward to new opportunities. I always plan to arrive one day in advance in order to scout the area and familiarize myself with the scenary and lighting to ensure your vision is captured as flawlessly as possible. I’m a photographer, do you offer workshops? I offer both one-on-one sessions as well as 5 day intensive workshops for photographers. Workshops are usually hosted in Greece. Please see my "workshops" page for more information or get in touch through email! Although my formal education is in philosophy and design, all of my practical and professional training has been in the arts and photography. Over the years my work has taken me near and far to capture celebrations, editorials and portraits from the Greek islands, to Thailand, Paris and beyond. I am devoted to the creative process and creating art and telling stories with beauty and soul through the lenses of my camera. Although I am definitely passionate about weddings, I also accept commissions for portait and lifestyle sessions such as engagement, anniversary, honeymoon, boudoir or family sessions. Do you collaborate on projects or editorial shoots? Yes! I love this sort of creative work. I'm always looking to connect and collaborate with artisans from all over the world. Planners, designers, florists, calligraphers... please get in touch! 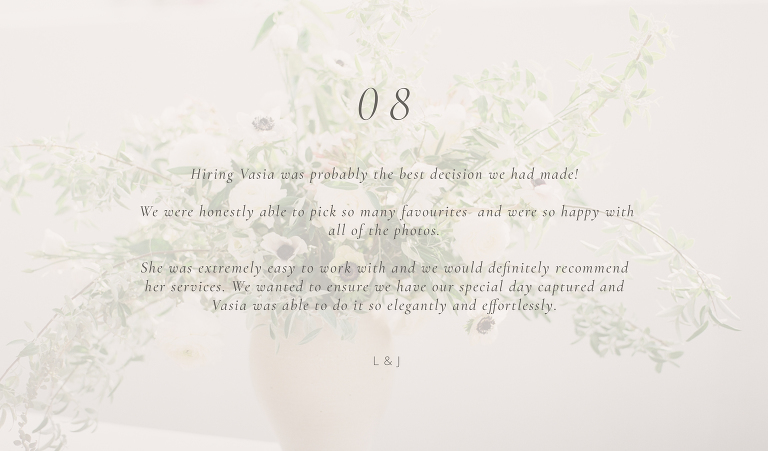 © 2019 Vasia Photography|ProPhoto Photographer Template|Design by Northfolk & Co.